This text comes from a manuscript of poems and carols (now Cambridge University Library MS. Ee 1.12) which was compiled by a Franciscan friar, James Ryman, in the last decade of the fifteenth century. Carols from Ryman's collection have featured on this blog several times before, most recently 'Behold and see', and I've been intending to post this one for a little while, as appropriate for this season of Lent. After watching the service for the reburial of Richard III this morning, it feels even more apt. The poem draws on Lenten texts - the 'wise man' of the first verse is Solomon, in an allusion to Ecclesiastes 3:20, and the reference to Job comes from Job 7:7 - but its theme is almost ubiquitous in medieval literature; some of my favourite expressions of it can be found under this tag. James Ryman was compiling his manuscript at Greyfriars in Canterbury c.1492, some seven years after his brother Franciscans had given Richard III his first burial in Leicester; but no fifteenth-century reader of this poem would have needed civil wars or bloody battles to remind them that earthly power is fleeting, and that worldly prosperity passes away from kings and commoners alike. How that erthe upon erthe may be heghe broghte. Bot how erthe to erthe sall, thinkes he no thinge. Thane shall erthe of erthe have full harde parting. 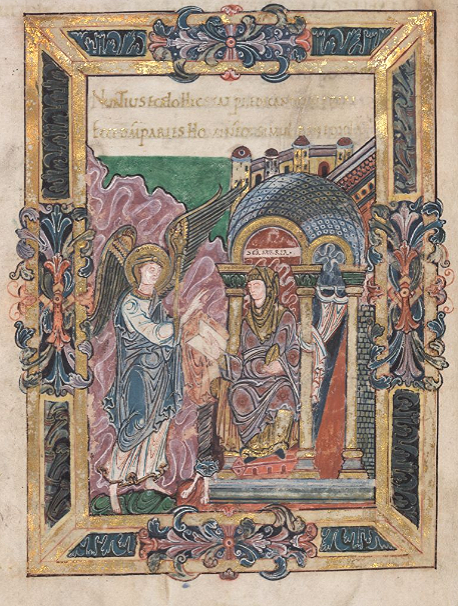 Today I thought I'd post an extract from an Anglo-Saxon poem about the Annunciation which might well be the first poetic treatment of this subject in English. It comes from the poem (or poem-sequence) known as Christ I, which is made up of poetic meditations on different aspects of the incarnation of Christ, drawing mostly on texts used in Advent. Some of the sections are based on the 'O' Antiphons, and I've posted about the richly creative responses to those liturgical texts before, in this post and several following it. Just as those poems begin with an address to Christ - 'O', in Old English the exclamation Eala - so this begins with an address to St Joseph: Eala Ioseph min, 'O my Joseph!' But rather than a liturgical acclamation, or a prayer, this is the voice of a woman speaking to her husband, and the poem is a dialogue in which Mary and Joseph discuss her miraculous pregnancy. in him sylfum beon soðe gefylled. have I received from this pregnancy! heaven's high angel, hailed me in greeting. truly fulfilled in his own person." It's interesting to compare this with another of the sections of Christ I devoted to Mary, 'Eala wifa wynn'; that too is a dialogue in which Mary is questioned about her pregnancy, and in response explains how she became the mother of Christ. But here the dialogue is much more personal, even intimate, exploring the complicated, shifting emotions of the couple: she seems to be worried about him, and he about her, both fearing the slander and hostility which her unexplained pregnancy will attract. But Joseph also doesn't understand what's happened to her, and is torn about what he should do - whether he should protect her by concealing her situation, or tell the truth and put her in danger. 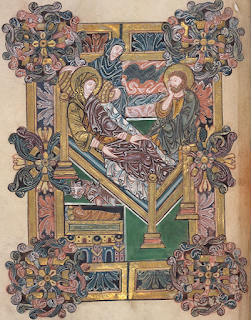 And so Mary describes Gabriel's visit, how he came to her, geongre in geardum (a young girl in the 'yards' at home). The first section of the dialogue is full of anxious fear, but in her final speech Mary speaks clearly and confidently: Soð ic secge, she says, 'I will speak the truth'. Gabriel's message, as she relates it, is all described in the language of light, as if it's light itself which is conceived in her. As so often, any translation falters before the wide range of words Old English had for light and radiance: here in just two and a half lines we have leoma, onlyhtan, beorht, torht. Instead of being 'filled with sins', as Joseph had feared, Mary is filled with light - and so the prophecy is fulfilled, gefylled. However, I am interested in medieval saints and relics, and especially in the texts which were composed to record their reburials, their 'translations' from one shrine or church to another. These texts are highly conventional, with a well-established pattern describing the finding, identifying, and reburying of a saint's remains, and it's amused and intrigued me to see how far Richard's reburial has echoed many of the generically typical features of a translation narrative. This is surprising, but useful, because translation narratives are often one of the most difficult aspects of medieval culture to explain to non-medievalists. 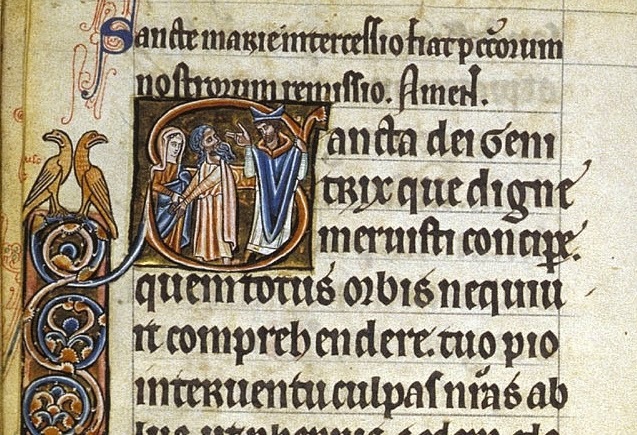 As someone who often blogs about medieval saints, I've found that stories about saints' relics and their elaborate translations always get a strong reaction. Some people think it's all just weird; it's alienating for them, and they frequently say they can't begin to understand it. Alternatively, they think they understand it all too well: the translation of relics, they say knowingly, was a cynical money-grab, designed to fleece pilgrims and bolster a church's prestige. But of course it's more complicated and more interesting than that. Saints' translations, and the texts written about them, can tell us fascinating things about the communities which organised these events: which historical figures were most valued and why, which parts of a community's history were most important to its identity at any point in time, how a community defined itself and told the story of its own past. In general, saints' translations are much less about the body being reburied than they are about the body which is arranging the translation, and these questions of identity, communal experience, and engagement with local and institutional history go much deeper than a desire for fund-raising. It's interesting to think about Richard's reburial in the context of medieval translations, not because what's happening to his body is actually in any way 'medieval', but because it helps to challenge some preconceptions about an aspect of the medieval past which is often said to be particularly alien to a modern audience. Let me give a few examples of generically typical features of a translation narrative, to illustrate some of the complexity of the forces which motivated these events. Many of these tropes are universal in medieval hagiography, but I'll take examples from Anglo-Saxon England, since that's what I know best; I'm focusing here not so much on how these events might have actually happened, but on how they were explained and described in narratives about the discovery and translation of relics. As in the case of Richard III, these texts often say that the impetus for the translation of relics came from an individual, rather than an institution. This might be someone who's had a vision telling them the saint wants to be translated: St Swithun's case is a famous example, in which Swithun appears in a dream to a smith, telling him the saint should be brought inside the Old Minster at Winchester. The saint plays the role of Merlin in a sword-in-the-stone story, instructing the smith that if he can pull a ring out of Swithun's tomb, it will prove the truth of the apparition; but more importantly, the vision and the translation story seem to have helped to negotiate a particularly contentious situation at the Old Minster, conflict between the newly-installed monastic foundation and the clerics they had displaced. For a community in an unsettling state of flux, rediscovering the bones of its patrons and saints could provide an important rallying-point, a focus of renewed communal identity emphasising shared interests which were able to transcend political, ethnic, or religious differences. In other cases, an individual might want to discover particular relics not because of a vision but in a spirit of historical or personal inquiry - although this could be dangerous. My favourite story of this kind is told by the historian Eadmer, a monk of Christ Church, Canterbury, who late in life described how his fellow monk/historian Osbern once persuaded him that the two of them should go and investigate some relics in the monastery's archives which had not yet been explored. This was during an interregnum at Christ Church, so Osbern presumably thought they should seize the opportunity to have a look while they could do so without get caught. The two curious historians went investigating, and found the relics of St Ouen. They were delighted, but the saint was less pleased - disapproving of their disobedient expedition, he punished them with some frightening dreams. This is a revealing story; the treatment of the saints' relics buried at Canterbury was a sore point with Eadmer, who thought they deserved much more respect than they had received from the post-Conquest leaders of the monastery. His description of his and Osbern's desire to go in search of long-lost relics is all at once a generic trope, a personal quest, and a historical investigation, and it's hard to separate out those motives. Saints were also often discovered in more mundane ways, of course, such as during building works; but however the relics have been found, they have to be identified. Sometimes there'll be an inscription or object which names them, but sometimes they can only be identified by a miraculous sign - a beautiful odour coming from the bones, that kind of thing. (Considering how the Channel 4 programme last night went into raptures over the miracle of DNA analysis, we'll take that as the modern-day equivalent.) Then the remains are examined, and as they're studied they reveal information about who the person was in life. Perhaps some particularly holy part of them is undecayed - like St Oswald's right arm which, blessed by St Aidan, remained miraculously intact - so the state of their physical body can confirm stories and legends already being told about their life. The relics allow those studying them to test theories about the person's moral character as well as their physical state. Once it's decided (from a mixture of evidence and powerful wishful thinking) that the bones belong to someone important, it's decided to move the body to a more worthy shrine. A Translatio will sometimes explain that the relics have to be removed from their original location because it's now in ruins, or in some other way an inappropriate resting-place; in the case of English saints it's often said that the original shrine was destroyed by the Vikings some time in the Anglo-Saxon period. In some cases this was probably true, but whether true or not, it provides a convenient way of explaining a break in the history of a shrine, and a reason why it needs to be renewed. This allows the present-day community performing the translation to look back at violent or disruptive periods in its own past, and express a desire for continuity with the time before the rupture. The modern community may be very different from that in which the saint lived - based in a new location, speaking a different language, belonging to a different religious order - but the narrative is one of continuity, where the modern institution presents itself as heir to that of the past, its history perhaps interrupted but ultimately unbroken. Interestingly, yesterday's procession for Richard, with historical re-enactors dressed up in medieval costume, goes much further with this than any medieval translation would have; and the rupture of the Reformation, at the core of the debate about whether the king should have an Anglican or Catholic reburial, is a much larger chasm to bridge than anything a medieval community faced. But these things can be negotiated when the desire for continuity, or the appearance of continuity, is strong enough. It's also common in translation narratives for possession of the relics to be contested, usually between two churches which both think they have a right to the body. Rather than a court case, this is often settled by a furtum sacrum (holy theft): stealing the relics under the cover of darkness, or perhaps doing something like inciting a rebellion so as to get the relics away while people are distracted (as when St Ælfheah was taken from London to Canterbury). Alternatively, you can just get the custodians drunk and steal the relics, as happened when the body of Bishop Eadnoth, killed in battle at Assandun, was on its way to be buried at Ramsey Abbey: the Ramsey monks made the mistake of staying the night at Ely, where the Ely monks got them drunk and stole the relics. (I'm not advocating this strategy, those of you who think Richard should be buried in York.) This might seem like undignified squabbling, but it often reflects real tensions and political fractures on a local or national level. Once the relics are secured, the successful church makes grand preparations, perhaps rebuilding part of the church to accommodate the new shrine and the expected increase in visitors. All the ceremony, thought and effort which goes into a translation makes it a hugely significant moment in the life of a community, important enough to be subsequently celebrated with a yearly commemoration on the anniversary. To mark the occasion, new texts are commissioned about the saint, retelling the narrative of his or her life in a way more suitable for a contemporary audience, and often finding fault with previous retellings (sorry, Shakespeare). You can do this in-house or commission an expert historian to write it for you; writers like Goscelin made a career out of doing it well, and were doubtless a bit more polite about it than some TV historians are today. In fact, some of the most important projects of historical investigation in the Middle Ages were undertaken to support saints' translations, responding to the need to understand and record who the saint was and what they meant to their community. For the best historians, this involved a sustained and thoughtful engagement with the past, a reflection on how and why it differed from the present, and how it related to the modern world and to the community they knew. This is itself a form of 'translation', a reworking of the narratives of the past for the needs and concerns of the present. And it wasn't only historians who undertook serious scholarly and creative work to accompany translations: these events could entail the examination of archives and documents, the composition of new music, the production of stained glass windows or vestments or other works of art, the building of ambitious architectural projects like the Corona at Canterbury Cathedral. Medieval translations of relics always involve a complicated interaction of forces, multiple currents which flow together: interests political, personal, devotional, financial, historical, and more. Amid all the fuss about Richard III's reburial, I've seen various people observe the parallels with medieval saints' cults with a note of disapproval - condemning the whole thing as medieval-in-the-bad-sense, where 'medieval' suggests superstition, irrationality, all the usual stereotypes. This troubles me. Whatever you think of how Richard's reburial is being conducted, it's clearly not 'medieval', since it's happening right now, in 2015, and in a manner in which no medieval community would have done it. For better or worse, what's happening this week is the product of our society, not of the Middle Ages. And since it's not easy to decide what it all tells us about ourselves, perhaps we could allow the medieval past the same complexity, and not just repeat cliches about superstition, raising revenue, how weird it is to care about bones, etc. There seems to be an idea that we can only talk about why and how people care for famous remains in order to pass judgement on whether they're right or wrong to do so - wrong historically, doctrinally, morally, or whatever. I don't think that's helpful. It is helpful to ask why people care so much about the relics of the famous dead, perhaps especially the royal dead; and it is helpful to wonder why some manifestations of that interest are perceived to be acceptable in the modern age, and some are not. I don't have answers to these questions, but they are worth asking. 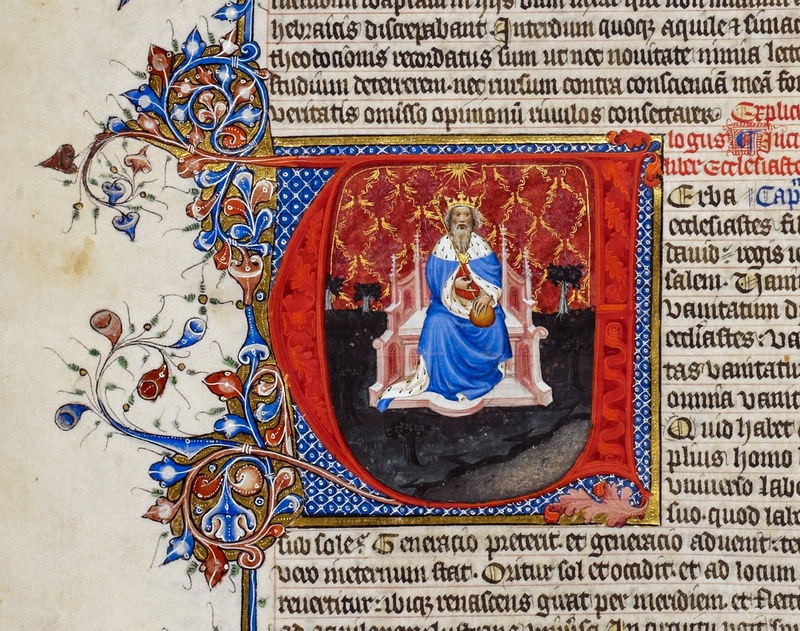 There's no doubt that many people today are fascinated by the relics of kings, even as they look down on the medieval age for caring about the relics of saints. We're quite accustomed to the idea of a royal shrine as a place of historical pilgrimage - or else Westminster Abbey wouldn't be able to charge such steep admission fees! Richard III isn't the only king, of course, whose body draws in the tourists. For a medievalist, it's always interesting to visit English cathedrals - most of which began life as a communities centred around a saint's shrine, and which in the Middle Ages defined their identity by the saints whose bodies lay within - and find them now focusing almost exclusively on their royal burials. I was especially struck by this at Worcester Cathedral, where King John's tomb, right in front of the high altar, is one of the cathedral's most prominent attractions, and every tourist is directed to it. John was buried at Worcester because he wanted to be near the shrine of St Wulfstan - but Wulfstan's tomb is gone, and John's survives. John has a pretty bad reputation as kings go (rivalled only by Richard III, perhaps) but it's accepted and expected that tourists will want to see his tomb; but wanting to see the site of St Wulfstan's tomb is a bit weird, a bit too 'medieval'. At Canterbury Cathedral, where the various royal tombs are all labelled and pointed out to tourists, one of the big attractions is the tattered accoutrements of the Black Prince - second-class relics hung up on display, before which every tourist is encouraged to pause and marvel - while the medieval pilgrims who marvelled at Becket's shrine are presented as something distinctly 'other', a historical oddity which has to be explained. Personally I find the fascination with royal relics puzzling, and interest in saints' relics much less so; at least medieval pilgrims believed that the people whose bodies they were so eager to encounter were holy, the remains of men and women of extraordinary virtue whose devout, self-denying lives infused their relics with power after death. Even the most dedicated defender of Richard III or King John doesn't quite claim that! This isn't a criticism of the cathedrals, which are understandably driven by what tourists want to see, or of the tourists themselves; it's an intriguing phenomenon, with various possible causes, but one cause is simply modern embarrassment about the medieval cults of saints, which is so deeply ingrained (I've talked about this before). I think it's helpful to try and overcome that embarrassment, or else it becomes a barrier in understanding the medieval past and its uses in the present. I don't want to downplay the differences between medieval saints' cults and the (to me, much stranger) modern fascination with long-dead royalty, but what's going on this week in Leicester provides a useful opportunity to challenge a popular modern narrative about medieval saints: the idea that our interest in relics is scientific and rational and scholarly, while their interest was superstitious and ignorant and silly. Translations and reburials are a moment at which to think about the intersection of the past and the present, to come literally face-to-face with the remains of history. Most translation narratives are about that, to some extent, and this week's events are no different. The parts of the Richard III pageantry which were (I suspect) supposed to seem the most 'medieval' - the costumed reenactors, the three soils in the coffin - are actually the least so, revelatory only of what we think the medieval past was like. But the complex mixture in these events of scholarly and personal desire, of communal and individual celebration, of serious study and popular pageantry, is neither uniquely medieval nor uniquely modern. 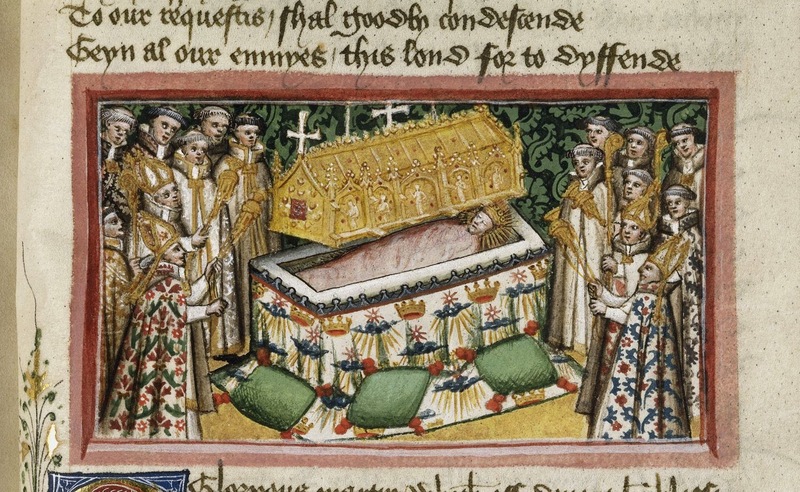 So if you're the kind of person who thinks it's weird that the Middle Ages cared so much about the relics of the famous dead, I suggest you pay close attention to the reburial of Richard this week. You can think that's weird, too, of course - but don't call it 'medieval'. For the feast of St Joseph, here are two fifteenth-century poems (or carols) on a popular medieval theme: Joseph's doubts about Mary's miraculous pregnancy. This theme may be most familiar today from The Cherry Tree Carol, but there are many versions and different forms of the legend in medieval (and later) tradition, elaborated from the story as briefly told in Matthew 1:18-25. My favourite is probably the exquisite song 'Marvel not, Joseph', with which the two poems in this post both have something in common. There's also a wonderful Old English poem which imagines an anguished but tender dialogue between the couple, and folk songs on the subject continued to be popular long after the medieval period. Focusing on this moment in the narrative provides a very human perspective on the strange and marvellous story of the Incarnation: poor puzzled Joseph, torn between his love for Mary and his natural suspicion of her pregnancy, is a sympathetic character, an ordinary man caught up in an extraordinary situation, who chooses in the end to trust rather than to doubt. The text of both of these poems is taken from Richard Greene, The Early English Carols (Oxford, 1977), pp. 162-4. In her of so full grete vertue. 'With her,' he seide, 'why shulde I dwell? Vnto Joseph vpon a nyght. Is Goddes sonne: be not afrayde. Fro blis into her wombe did light. And geve vs blisse withouten ende. Of God, that is bothe iii and One. This text comes from the extensive manuscript of carols (now Cambridge University Library MS. Ee 1.12) which was compiled by the Canterbury Franciscan James Ryman in the last decade of the fifteenth century. I've posted carols from this manuscript several times in the past, most recently 'Behold and see'. This carol has some particularly appealing touches: it's sweet (if distinctly unbiblical!) that Joseph wants to leave Mary because she's too good for him, a characterisation which forms an interesting contrast to the angry Joseph of some of the mystery plays. And what a lovely phrase 'God, that hath all grace in store' is. In her of such great virtue. 'With her,' he said, 'why should I dwell? Unto Joseph upon a night. Is God's Son: be not afraid. From bliss into her womb did light. And give us bliss without an end. Of God, that is both three and one. 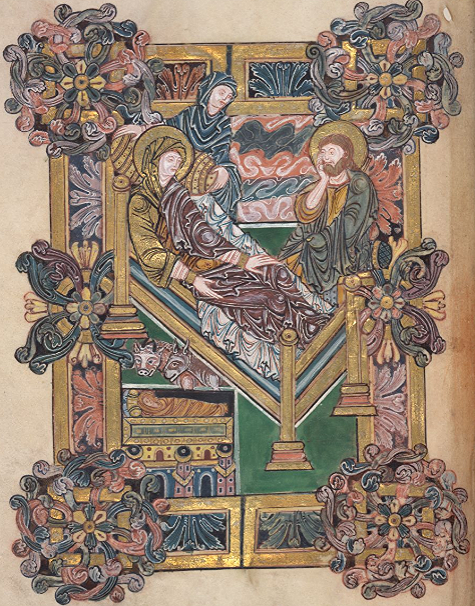 Our second carol (from BL Add. 20059) has a similar refrain to 'Marvel not, Joseph', but it is doesn't tell the story of Joseph or his dilemma; instead it takes his bemusement, and the injunction to him not to 'marvel', as a starting-point for a discussion of mystery, reason and faith. It's a reminder that Joseph in these stories, confused and impulsive and so very human, is a stand-in for the audience, wondering how to make sense of a miracle so far beyond mortal understanding. She hath conceyved vere God and man and yet she undefiled. Conceyved man, how may that be by reason broght abowte? Wherfore, Joseph, marvell not thaghe Mary be withe chyld. And conceyved God, our brother, as prophettes before hade saide. Sithe God made reason, why may not reason of his werkes be begyld? Wherfore, Joseph, mervell not though Mary be with chyld. Is gode reason that above all reasons shuld passe our reasons ferr. Wherfore, Joseph, mervell not though Mary be with child. Is God and man, flesshe and blode, he that was quyck and ded. His is gode reason above all reasons, Mary to be with child. By reason the be, but what the be reason cannot defyne. And mervell no more, but fast beleve Mary was maide with chyld. She hath conceived very God and man and yet is undefiled. 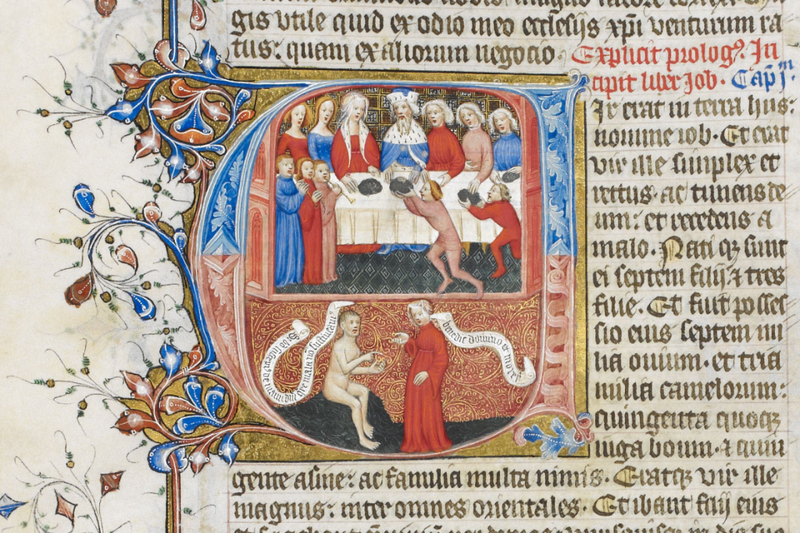 'Conceived man'; how may that be by reason brought about? Wherefore, Joseph, marvel not though Mary be with child. And conceived God, our brother, as prophets before had said. Since God made reason, why may not reason of his works be beguiled? Is good reason that above all reasons should pass our reasons far. Is God and man, flesh and blood, he that was quick and dead. His is good reason above all reasons, Mary to be with child. By reason they be, but what they be reason cannot define. And marvel no more, but fast believe Mary was maid with child. On þissum monðe gesceop God ælmihtig ealle gesceafta, gesewenlice & ungesewenlice. He cwæð, ‘gewurðe leoht’, & hyt gewearð. Se dæg wæs on .xv. kalendis Aprilis. In this month almighty God created the whole of creation, visible and invisible. He said, 'Let there be light', and it was done. That day was on 18 March. According to some medieval calculations, today, 18 March, was the date of the first day of creation - the beginning of the world. It's sometimes even marked as such on medieval calendars (for example, this twelfth-century English calendar). It might seem like an arbitrary date, but it's very far from that; for the complex theological and scientific arguments which lay behind this dating, and its long and varied history, I refer you to this book. Like many such medieval calculations, the significance of the date is less to do with a belief that it was literally true than with a sense of what would be the most fitting and appropriate date for the first day of creation, the date most in harmony with the medieval Christian understanding of time. So why 18 March? To summarise very briefly: it was worked out backwards from the most important such calculation in the early church's calendar, the dating of Easter. From a combination of factors, including the information given about Christ's death in the Gospels, the date of the equinox, the beginning of spring and, most importantly, the essential link between the death of Christ and the Jewish Passover, the historical date of Good Friday was worked out to be 25 March. (The day on which it should be commemorated by the church was a separate, and even more complex issue...) Since 25 March was therefore the date of - as they saw it - the most significant event in history, the central turning-point around which all time and space revolved, it was seen to be fitting to link to this date key events in salvation history connected to, or prefiguring, the death and resurrection of Christ: the Annunciation, the sacrifice of Isaac, the crossing of the Red Sea. It was thought fitting too for 25 March to be the eighth day of creation - and that means, if you count backwards, that 18 March is the first. The exactness of this date might raise a smile, and it's a way of thinking about time which is foreign to a modern secular mindset; the day derives its meaning not only from a historical event but also from its place in the interlocking cycles of lunar, solar, seasonal and even zodiacal calendars, which were all understood to be imbued with purpose by the divine Creator who was their source. The complexity of the calculations (much more intricate than I can attempt to describe here) is so impenetrable that you can understand why today people prefer to believe that the date of Easter was just 'stolen' from some equinox-loving pagans - a much more immediately accessible explanation, if unfortunately wrong! But there is something beautiful about the desire to identify these dates with precision and care. It's of a piece with the way the creation of the world is often depicted in medieval art, as in the image above from an Anglo-Saxon manuscript: God is shown with scientific instruments, tools and scales which are images of balance and precision. When the first divine act of creation was imagined as careful, scientific workmanship, it would have seemed only right to be as exact as possible in understanding the world's origins. There were of course various alternative ways of interpreting all this data, and the 18-25 March theory I described above was far from universal. It was, however, popular in early medieval England, mostly due to the influence of Bede. 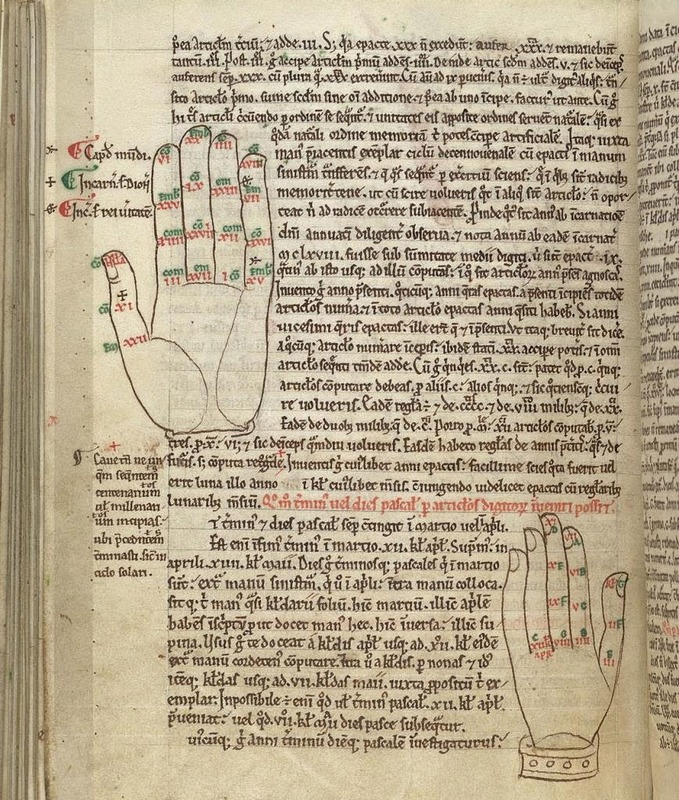 The quotation at the top of this post comes from an Old English text known as Byrhtferth's Enchiridion, which was written at Ramsey Abbey, in what's now Cambridgeshire, in 1011. 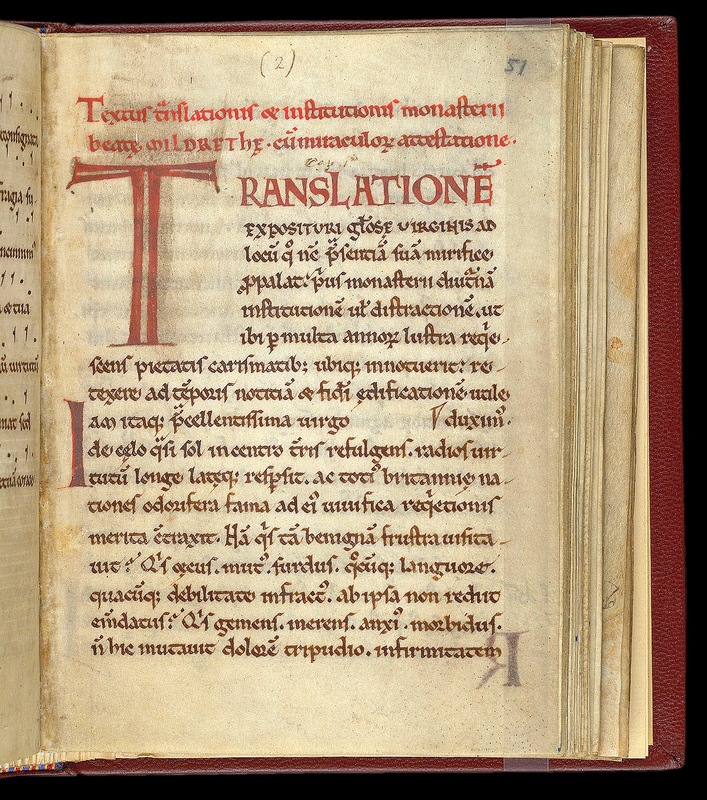 Byrhtferth, a monk of Ramsey, was a learned historian and scientist, and his Enchiridion is a guide to the scientific thinking of his day, written in English for the benefit of those less skilled in Latin than Byrhtferth himself. 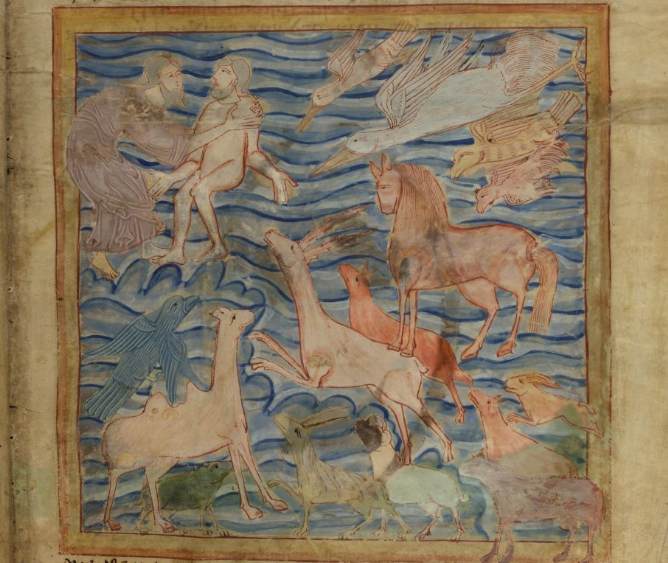 Since on this blog I often post about medieval historical narratives, I thought it might be interesting - on this anniversary of the first day of the world - to look at the story in Old English of the very first days of history, as described by Byrhtferth and an Anglo-Saxon translation of the Book of Genesis. 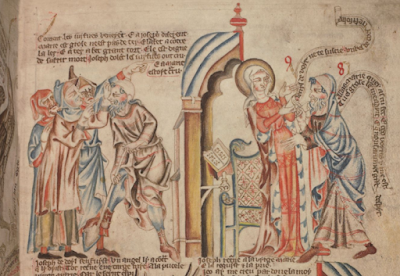 The translation, and all the illustrations below, come from an amazing manuscript of the Old English Hexateuch (British Library, Cotton MS. Claudius B IV), an English translation of the first six books of the Old Testament. 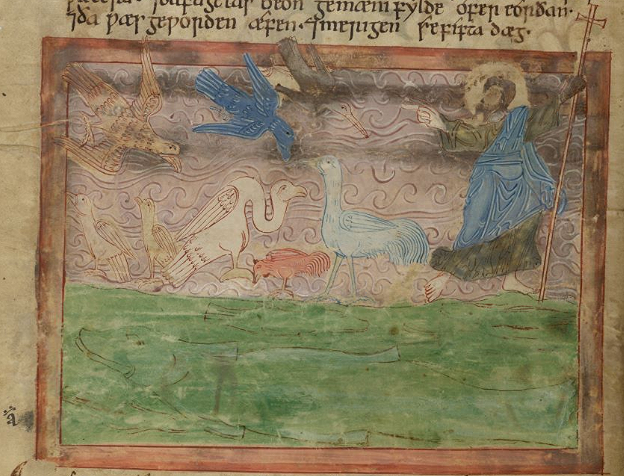 It survives in several manuscripts but this one, the most complete, was produced in the eleventh century at St Augustine's, Canterbury, and is richly illustrated with hundreds of detailed and spirited pictures. You can zoom in and explore the full manuscript to your heart's content on the British Library's site here; the illustrations I've used of the days of creation are from ff. 2v-4v. Quotations are from Byrhtferth's Enchiridion, ed. Peter S. Baker and Michael Lapidge (Oxford, 1995). 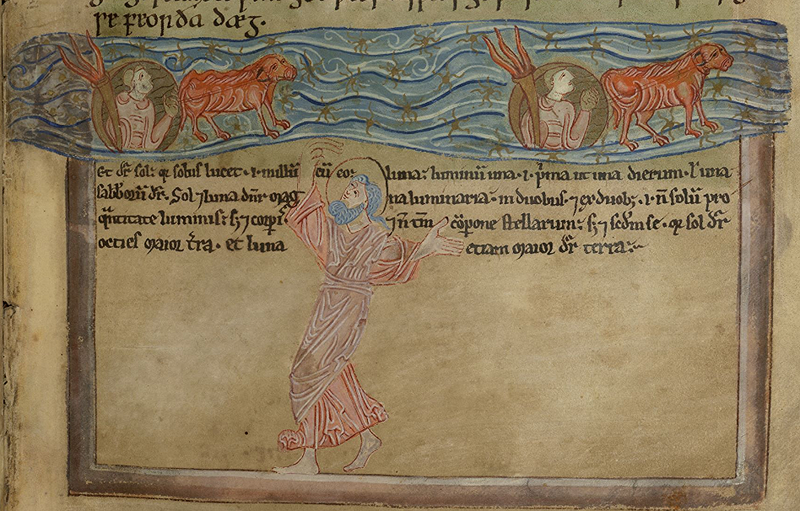 The first day, we've already heard about: on 18 March he cwæð, ‘gewurðe leoht’, & hyt gewearð. For Byrhtferth this date might have had a little extra personal resonance: he tells us elsewhere in his work that his own monastery of Ramsey was founded (that is, the first stone was laid) on 18 March 965, so Byrhtferth's own 'world', the abbey where he spent most of his life and where he acquired all the learning he displays in this treatise, was created on this date too. And at the time he was writing his Enchiridion, 18 March also happened to be the feast of England's newest and most controversial saint, the murdered teenage king Edward the Martyr, who was killed in murky circumstances on this day in 978. The second of these dates is coincidence, though Byrhtferth was certainly aware of it, but the first may well have seemed meaningful; in the computistical view of the world, there really are no coincidences. God cwæð ða eft: Gewurðe nu fæstnys tomiddes ðam wæterum, 7 totwæme ða wæteru fram ðam wæterum. 7 God geworhte ða fæstnysse, 7 totwæmde ða wæteru ða wæron under ðære fæstnysse fram ðam ðe wæron bufan ðære fæstnysse. Hit wæs ða swa gedon. 7 God het ða fæstnysse heofenan. 7 wæs ða geworden æfen 7 mergen: oðer dæg. God said then: Let there be now a firmament between the waters, to separate the waters from the waters. And God made the firmament, and separated the waters which were under the firmament from those which were above the firmament. So it was then done. And God called the firmament 'sky'. And then evening and morning were past: the second day. On þam oðrum dæge he geworhte firmamentum, þæt ys þeos heofon. Heo ys gesewenlic and lichamlic, ac swa þeah we ne magon hig næfre geseon for þære fyrlenan heahnysse. Seo heofon beligð on hyre bosme ealne middaneard, and heo æfre tyrnð onbutan us; heo ys swyftre þonne ænig mylenhwiol, eall swa deop under þisre eorðan swa heo ys bufan. Eall heo ys synewealt and ansund and mid steorrum amet. Soðlice þa oðre heofenan þe bufan hyre synt and beneoðan synt ungesewenlice and mannum unasmeagendlice. Synd swa þeah ma heofena, swa swa se witega cwyð: ‘celi celorum’. On the second day he made the firmament, that is, the heaven. It is visible and corporeal, but nonetheless we are never able to see it, because of its great height. The heaven encompasses the whole earth in its bosom, and it is always turning about us; it is swifter than any mill-wheel, just as deep below this earth as it is above. It is entirely spherical and whole, and adorned with stars. Truly, the other heavens which are above and beneath it are invisible and inscrutable to men; but there are more heavens, as the prophet says: 'heavens of heavens'. On þam þriddan dæge, þæt ys on .xiii. kalendas Aprilis, he gesceop ealle trywcynna and ealle grennyssa. On the third day (that is, on 20 March), he created all kinds of trees and all green things. He cwæð, Sprytte seo eorðe growende gærs 7 sæd wyrcende, 7 æppelbære treow wæstm wyrcende æfter his cynne, ðæs sæd sy on him syluum ofer eorðan. Hit wæs ða swa gedon. 7 seo eorðe forð teah growende wyrta 7 sæd berende be hyre cynne, 7 treow wæstm wyrcende 7 gehwilc sæd hæbbende æfter his hiwe. God geseah ða ðæt hit god wæs. 7 wæs geworden æfen 7 mergen, se ðridda dæg. He said, Let the earth sprout green plants, growing and yielding seed, and apple-bearing trees yielding fruit after their kind, whose seed is in itself upon the earth. So it was done. And the earth brought forth growing plants, bearing seed according to their kind, and trees bearing fruit, each having seed according to its kind. God saw that it was good. And evening and morning were passed: the third day. On þam feorðan dæge, þæt ys on .xii. 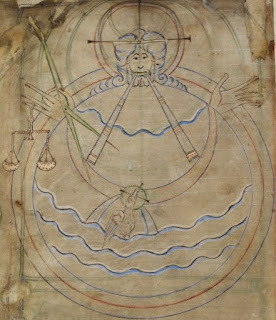 kalendas Aprilis, he gesceop sunnan and monan and steorran and ealle tungla, and on ærnemergen þæs dæges uparas seo beorhte sunne riht on eastende þære heofon, and þæne monan þæs ylcan æfenes he gesette on þære ylcan stowe, and he wæs full swa swa he byð þonne he byð fiftyne nihta eald. Þæne forman dæg þisre worulde man mæg findan, swa ic herbufan cwæð, þurh þæs lengtenlican emnihtes dæg, forþon se emnihtes dæg ys se feorða dæg þissere worulde. Þry dagas wæron ær þam dæge butan sunnan and monan and eallum steorrum. On the fourth day (that is, on 21 March), he created the sun and moon and stars and all planets, and at dawn of that day the bright sun rose right at the eastern edge of heaven, and on the same evening he placed the moon in the same place, and it was as full as it is when it is fifteen days old. The first day of the world can be calculated, as I said above, by the day of the spring equinox, because the day of the equinox is the fourth day of this world. There were three days before that day without sun or moon or any stars. was full at sunset, for the Creator, Who is justice itself, would never make something in an imperfect state. It appeared, together with the glittering stars, in the mid-point of the east, and stood in the fourth degree of Libra where the autumn equinox is fixed, and by its rising, it sanctified the beginning of Easter. For the only Paschal rule to observe is that the spring equinox be completed, with a full Moon following. But if the full Moon precedes the equinox by a single day, it is considered to be the Moon of the last month, and not of the first. For it is fitting that just as the Sun at that point in time first assumed power over the day, and then the Moon and stars power over the night, so now, to connote the joy of our redemption, day should first equal night in length, and then the full Moon should suffuse [the night] with light. This is for the sake of a certain symbolism, because the created Sun which lights up all the stars signifies the true and eternal light which lighteth every man that cometh into the world, while the Moon and stars, which shine, not with their own light (as they say), but with an adventitious light borrowed from the Sun, suggest the body of the Church as a whole, and each individual saint. These, capable of being illumined but not of illuminating, know how to accept the gift of heavenly grace but not how to give it. Bede, The Reckoning of Time, trans. Faith Wallis (Liverpool, 2004), p. 25. Scripture and science are in harmony here; every aspect of the natural world is filled with meaning, and reveals God's creative purpose. This is a view of the world which sees nothing - no date, no rule, no custom - as meaningless or random, for those who have the will to understand. the sun and moon on that same day. On þam fiftan dæge, þæt ys on .xi. 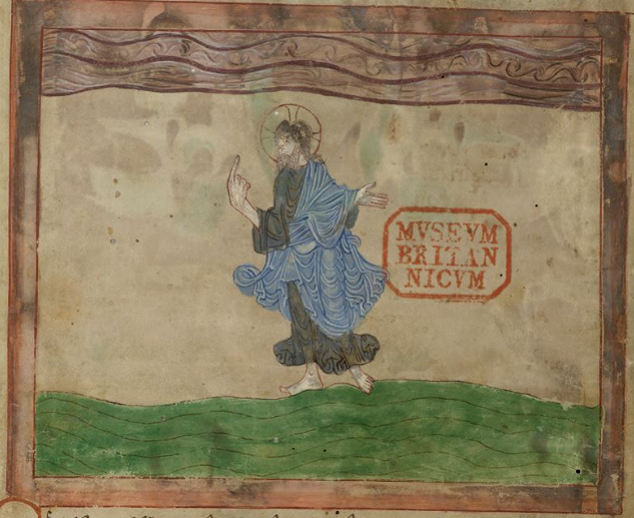 kalendas, he gescop eall wyrmcynn and creopende and fleogende and swymmende and slincgende and þa myclan hwælas and þa lytlan sprottas and eall fisckynn on myslicum and mænigfealdum hiwum. On the fifth day (that is, on 22 March), he created all kinds of serpents, and creeping, flying, swimming and slinking creatures, and the great whales and the little sprats and all kinds of fish in various and manifold shapes. And, finally, the creation of Adam and the animals. On þam syxtan dæge, þæt ys on .x. 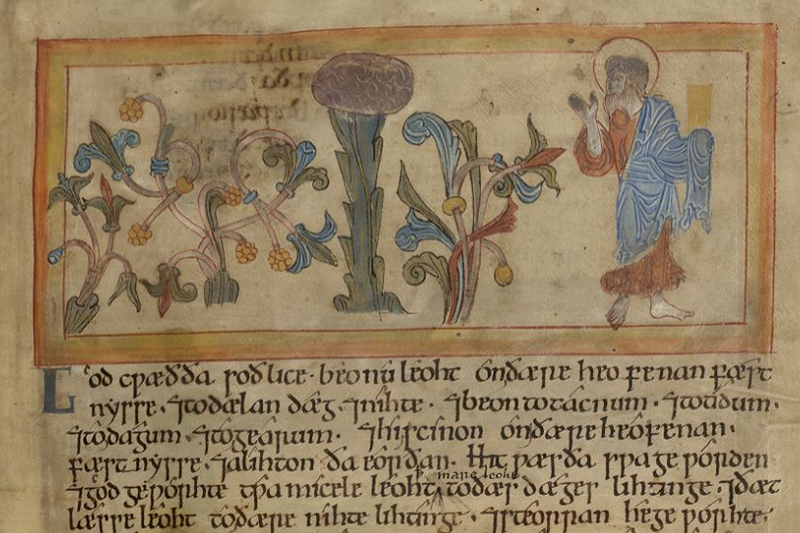 kalendas Aprilis, he gescop eall deorcynn and ealle nytenu þe on feower fotum gað and þæne man Adam, and Euan, and þa he gebletsode. On the sixth day (that is, on 23 March), he made all species of animals and all beasts that go on four feet, and the man Adam, and Eve, and he blessed them. The creation of Adam is sometimes marked on March 23 in medieval calendars (in this thirteenth-century calendar, for example). On þam seofoðan dæge he geendode his weorc, þæt ys .ix. kalendas Aprilis, and seo wucu wæs agan, and he gebletsode þæne dæg. Se eahtoða dæg com þa æfter þam seofoðan and gewearð to þam þæs dæges þe wæs .viii. kalendas Aprilis. Se dæg wæs amearcod on Godes foresceawunge. On þam dæge wæron englas gesceapene; on þam dæge wæs se heahengel Gabriel asend to Sancta Maria; on þam dæge he aras of deaðe; on þam dæge Godes gast com to mancynne. 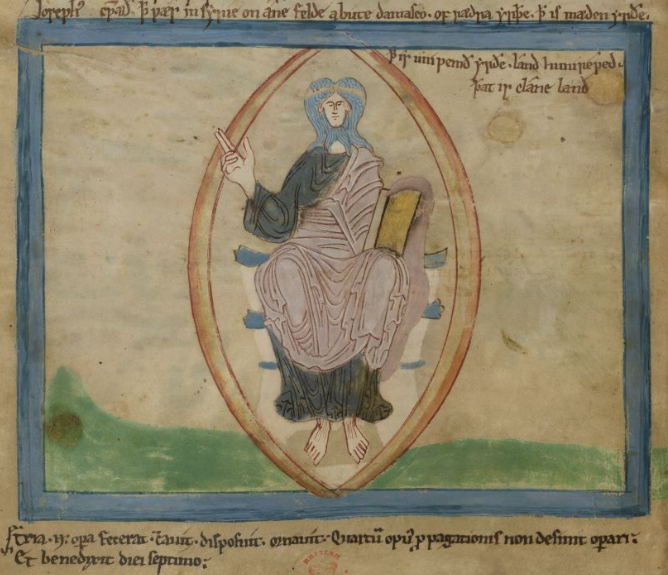 He ys halig Sunnadæg; þonne ealle dagas ateoriað, þonne þurhwunað he aa on his symbelnysse. He ys engla bliss and ealra haligra ece frofor. On the seventh day he ended his work (that is, on 24 March), and the week was finished, and he blessed that day. The eighth day then came after the seventh, and it fell on the day which was 25 March. That day was marked out in God's providence. On that day the angels were created; on that day the archangel Gabriel was sent to St Mary; on that day he arose from death; on that day God's spirit came to mankind. It is holy Sunday; when all days fail, it will endure forever in its festiveness. It is the joy of angels and eternal benefit to all the saints. 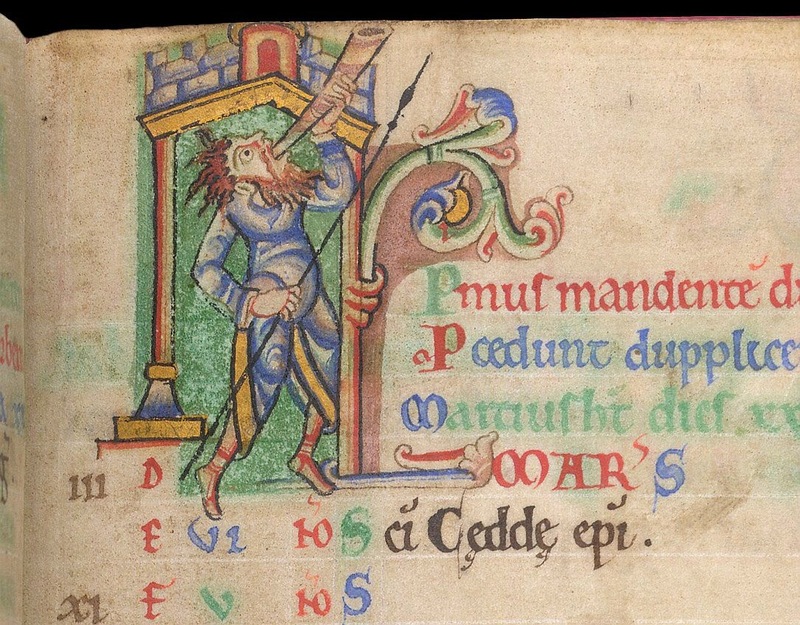 At the beginning of a new month, we can have a look at the Old English calendar poem known as the Menologium (last seen here in February heralding the start of spring) to see what it has to say about March. After the warrior March we hear about two great men of a very different kind. 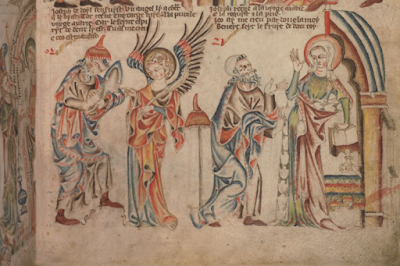 The month of March is distinguished by the feasts of two saints who loomed very large in Anglo-Saxon perceptions of their own history: Gregory the Great (March 12), who was credited with sending Christianity to England, and Benedict (March 21), father of monasticism, to whom the many Benedictines of Anglo-Saxon England looked as their founder and inspiration. Gregory is described as breme in Brytene 'famous, brilliant in Britain' because of his central place in the history of the English church. 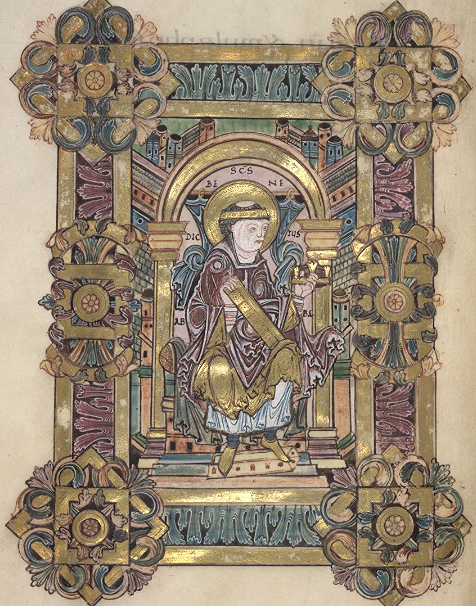 Not only was he, according to Bede, the prime mover in the conversion of the English, but his writings were among the works King Alfred considered 'necessary for all men to know', and many had been already translated into English more than a century before this poem was written. Like Ælfric in his sermon for New Year's Day, this poem notes the coincidence of St Benedict's feast on March 21 with the spring equinox - the Old English word for the equinox is emniht, from efen + niht 'even nights'. 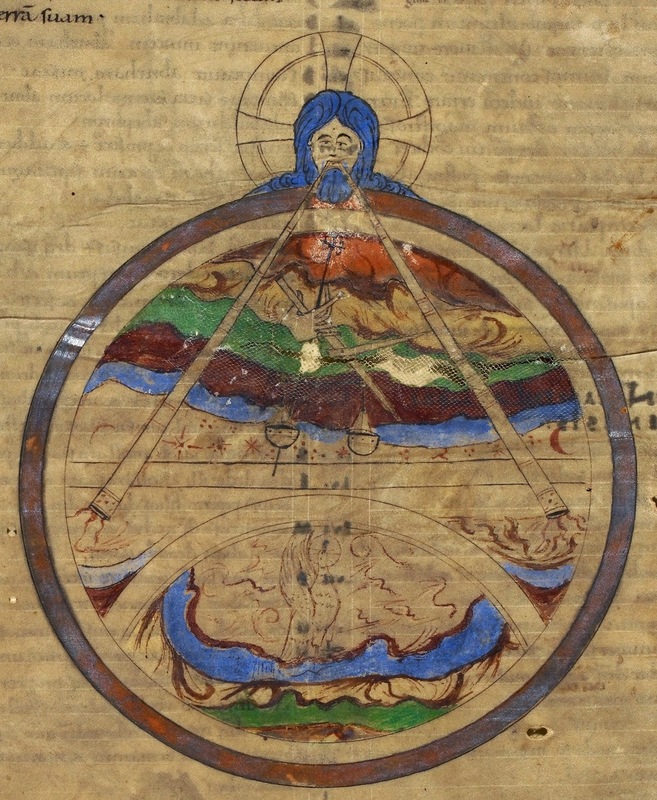 The spring equinox was the key date for calculating the rest of the calendar: it was considered to be the day on which the sun and moon were made, and therefore the day 'all times were created' (as Ælfric puts it), on the fourth day after the creation of the world on March 18. From this, every other date in the year - the solstices and equinoxes, the duration of the seasons, etc. - could be worked out, as well as the date of Easter. This was all very carefully calculated by the people this poem calls the rimcræftige, 'those skilled in numbers' (a fantastic word for any mathematicians out there!). In Anglo-Saxon England these rimcræftig scientists were usually the rincas regolfæst, the learned Benedictine monks. I have to confess that these subtleties of computus are a bit beyond me; I'd number myself among the manega sydefulle clericas who, as Byhrtferth gently notes in his attempt to explain the system, don't understand such mysteries as quadrans and bissextile days. I content myself with marvelling at the skill, patience, and learning of the rimcræftige, who work these things out so the rest of us don't have to.